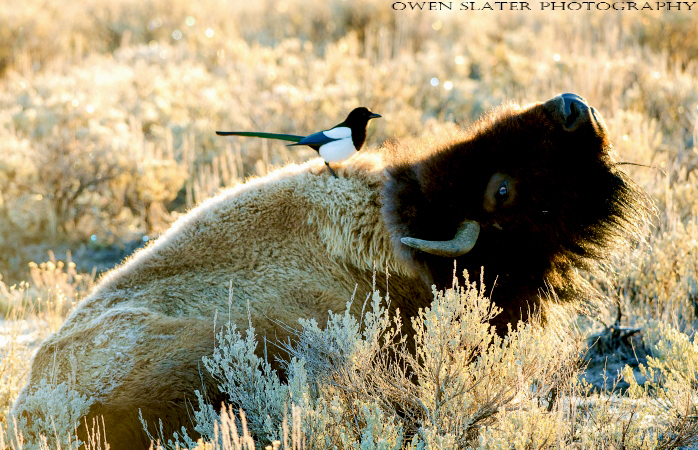 There are two things that are pretty common in Yellowstone during the spring. Almost everywhere we went we saw herds of bison and large flocks of mountain bluebirds, all of them searching out areas in the park where the snow had either completely disappeared or was just about to. The spring thaw and green-up was in full swing which made for prime feeding grounds. The bison were chomping down on tiny stems of green grass wherever they could find it and when that wasn’t available or was covered over in fresh snow, they resorted to winter-killed, high roughage stalks of grass. Bison have lots of character and this one seemed to want to go for a hillbilly look and I must say, pulled it off better than anyone else I have seen try. 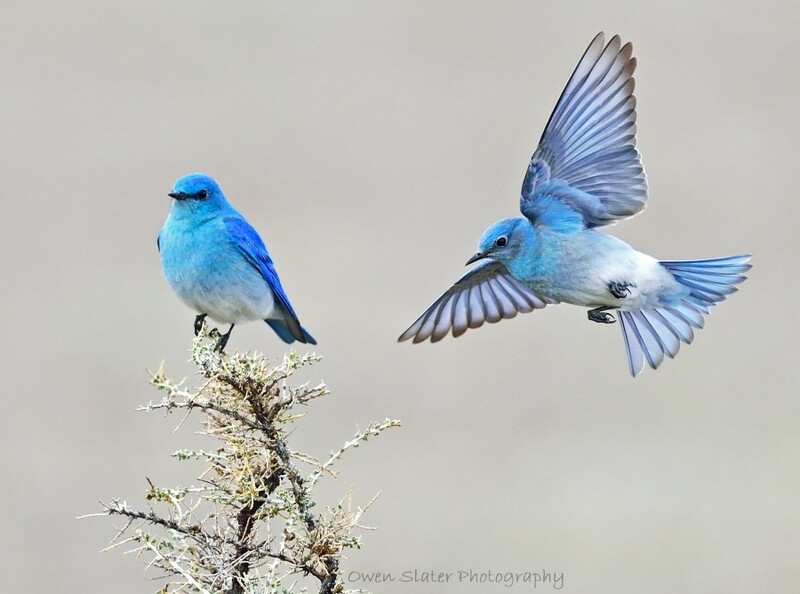 It wasn’t until watching the bluebirds for some time that it became clear they were relying on by-products of bison to help them survive the first few months of spring. In March and early April there aren’t as many insects to feed on. But as it turns out, buried within and under old bison patties are lots of overwintering insect larvae. 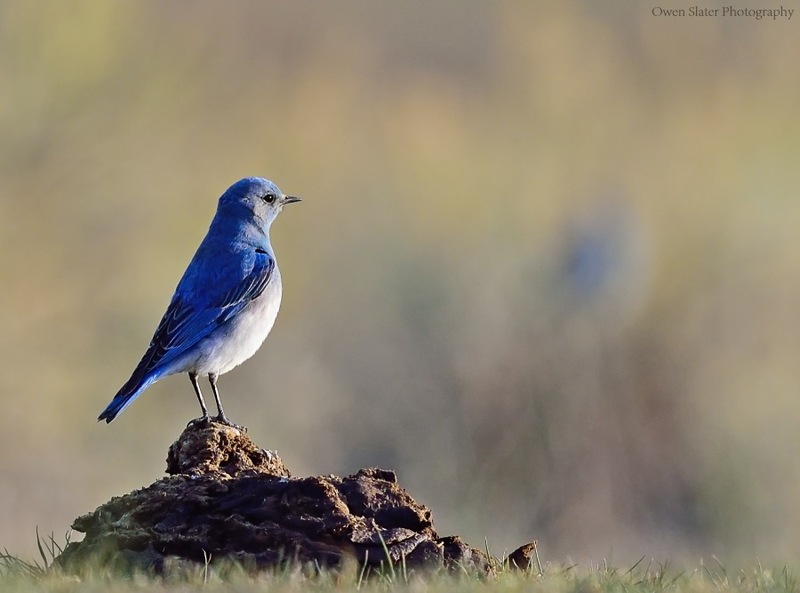 With their keen eyesight, the bluebirds snatched these insects up as they emerged from the dried-up dung. Other times they would use the piles as perches to get a better vantage point to spot their next meal. As the saying goes, one person’s trash is a another person’s treasure! To some, this might diminish the image of these beautiful birds, but without them we would suffer even more from the torture of biting flies, mosquitoes, ticks and other pesky insects. So for me it adds another level of appreciation since doing all of this dirty work and still looking good can’t be easy. With that I will end on a high note with one last photo that showcases just how spectacular and stunning these birds really are. 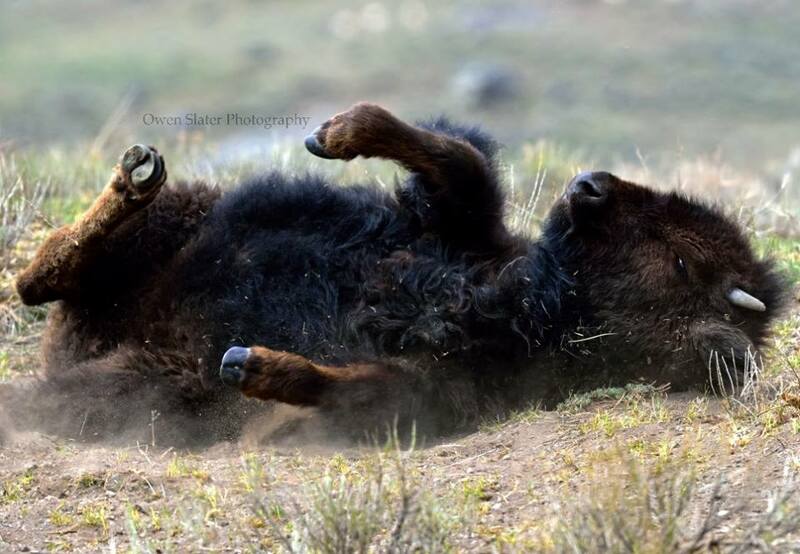 Whether scratching an itch, trying to remove flies and ticks, showing off during the rut, or just for fun, bison seem to get lots of enjoyment and satisfaction from rolling around in the dirt. This youngster spent several minutes having a great time getting dusted up before racing off to rejoin the herd. It will be great to see these beasts back in Banff National Park in the near future. If you are ever in Saskatchewan this park is one of the gems of the province and certainly well worth the detour. The early morning light created beautiful soft colours on the bison’s coat and off of the small bushes in the background. Where has April gone? I will try to catch up on my posts over the next few weeks. I took this one in Yellowstone about a month ago. The bison herd was bedded down and just waking up from a frosty night in the park. The magpies were going from one bison to the next, singing their typical magpie songs and picking off bugs as the sun rose over the hills. Most of the bison didn’t seem to mind the wake up call, but this one didn’t take too kindly to it. It tossed its head back several times to try to dislodge the bird, but the magpie just ignored him. Eventually the bison gave up his protest and went back to trying to get some more rest. I’m going through images from last year that I haven’t gotten around to posting. 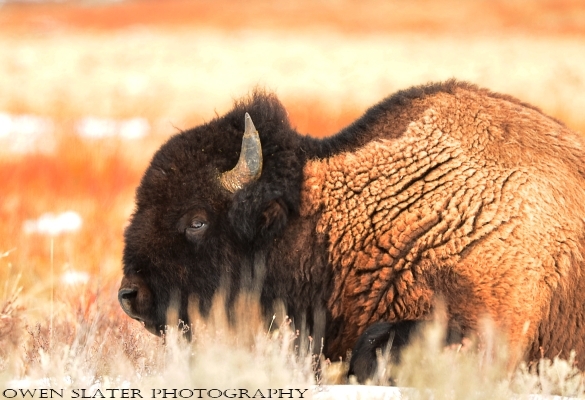 This is from the buffalo paddock in Waterton Lakes National Park. The herd crested over a hill just as the sun rose above the landscape allowing me to create this image of a young male calf having some golden grass for breakfast. 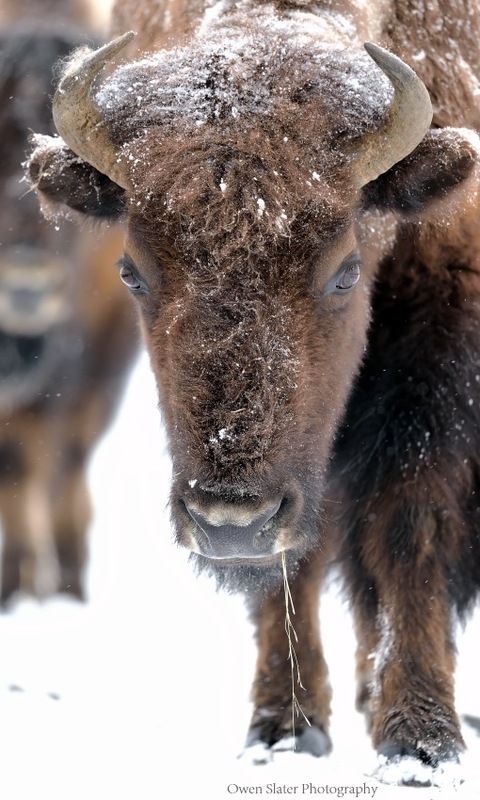 One of three bison calves born this year in Waterton Lakes National Park. In Waterton the bison are kept in a large paddock. This year there are three calves increasing the herd size to 14 animals.